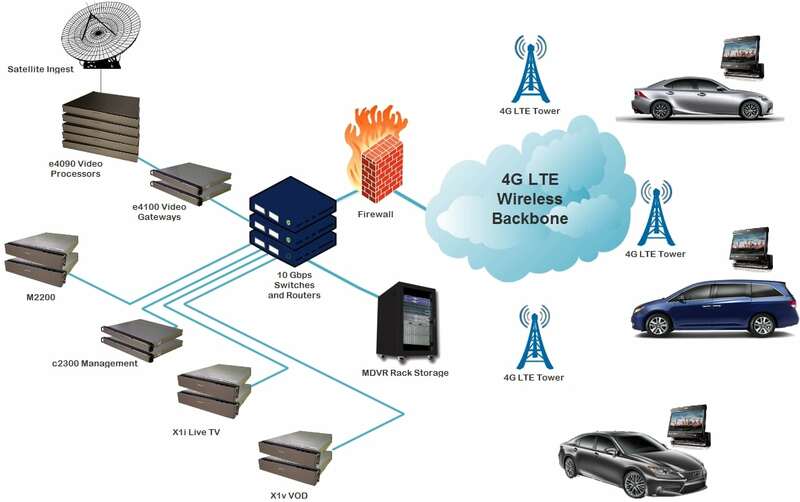 Automobile IPTV Solution - MatrixStream Technologies, Inc. Customer is an IPTV broadband provider who would like to offer OTT IPTV services over broadband wireless network any cars equipped with MatrixStream HD player. The provider would like to offer both live streaming TV channels as well as video on demand videos. The ability to offer unlimited video on demand and live TV channels will allow commuters to enjoy the long boring commutes. The deployment of the OTT IPTV service will be over wireless broadband such as WiMAX IP network. 2 IMX M2200 OTT IPTV middleware servers. 1 for management and another for redundancy. 6 IMX v2420 VOD MatrixCast Streaming servers to support VOD. 5 IMX v2420 can support up to 6,000 simultaneous SD streams. At the same time, each server can back up the other through N+1 clustering design.